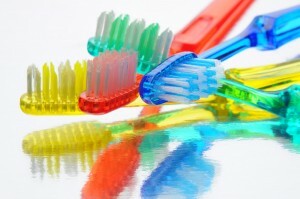 Home » Blog » The Toothbrush: How Much Do you Know? There is actually a deep, interesting history behind the tiny little product that we call the toothbrush. The toothbrush has been around for centuries, and over time, it has undergone countless changes and enhancements. Changes to the toothbrush have been made by research corporations, dentists, prisoners and even Chinese monks. Today, you might not think of the toothbrush as a radical invention, but it plays an essential role in maintaining proper oral health. The first signs of anything resembling a toothbrush come from 3,500 B.C. The Egyptians and Babylonians used to chew of an ancient toothbrush until one of the ends of the material became soft. During the Tang Dynasty, the Chinese used an ancient version of the toothbrush, which occurred around 600 A.D. Some of the earliest toothbrush models were created from animal bones, bird feathers and tree twigs. The first mass-produced toothbrush came from England and was created in 1780. William Addis was the original creator of the first toothbrush. During 1770, he had plenty of time to think about a design because he spent lots of time in cells. While in the cells, he was using a combination of bristles and bones to create a makeshift toothbrush. After he was released, he created Wisdom Toothbrushes, which went on to mass-produce his invention. By the time 1840 rolled around, toothbrushes were being made in Japan, Germany, France and England. In 1885, America decided to jump onto the toothbrush bandwagon and started mass-producing toothbrushes. Something that many people find disgusting is the fact that toothbrushes weren’t used daily until long after World War 2 had finished. In 2003, the toothbrush was actually voted as the top invention that Americans said they couldn’t live without. Ironically, despite this fact, most Americans still don’t brush their teeth twice per day. In the modern world, you’ll find no shortage of toothbrush styles to choose from. Many companies have even created automated versions that can clean your teeth better than their manual counterparts. Today, there are even toothbrushes that are made from biodegradable materials. In the 1980s, Johnson & Johnson created a product called the reach toothbrush. When compared with previous iterations of the toothbrush, the reach style offered three main differences. To better simulate a dental instrument, it was built with an angled head, and it was better at reaching the teeth in the back of the mouth. The other major difference was that the bristles were much more closely concentrated than previous models. The third major difference was the bristle sizes. Outer bristles were made to be softer than inner bristles and could clean between teeth. One of the newest iterations is the electric toothbrush, which was first envisioned in 1954. Dr. Philippe-Guy Woog thought up the idea while in Switzerland. During 1959 to 1990, about 15 million electric toothbrushes were sold, and today, it’s still an extremely popular product. In the modern world, there are even chewable toothbrushes, which are made to be used once and dispense toothpaste when the bristles are chewed on. While there is nothing glamorous about the history of the toothbrush, it does have an interesting history and gives you something to think about the next time you use your favorite toothbrush.